Let’s forget everything that happened in this game, including the part about how the ball below is basically a representation of the Jazz’s season at this point in time. Instead, let’s revel in this play, and our future, which is spelled F-A-V-O-R-S.
Is anyone else really turned on right now? ** We gotta learn our lessons from it. You gotta learn from what they do. ** We gotta keep fighting. We gotta keep fighting. ** We have to put guys in situations, do different things to give us a chance to win. ** We gotta keep fighting. We gotta learn. We gotta keep trying to tweak things to give ourselves a chance to win. ** We just have to keep trying to force our will on them. ** We gotta find a way to get inside. ** We gotta make free throws….we just have to make them…we gotta make the shots. ** We have to learn from them. We have to learn how we have to be more intense…we just have to continue to work at it. ** Boler on Al: Wants to find that rhythm early as he backs in on Duncan. ** Harpring on Favors: He is growing in front of our eyes! ** Big Al on the Spurs, post-game: They do a good job of just sitting in my lap and acting like they coming. ** Tyrone Corbin on the Spurs, post-game: We wanna get inside, and they want to keep us from getting inside. So we’ll try to change some things, see if we can come at it from a different angle. 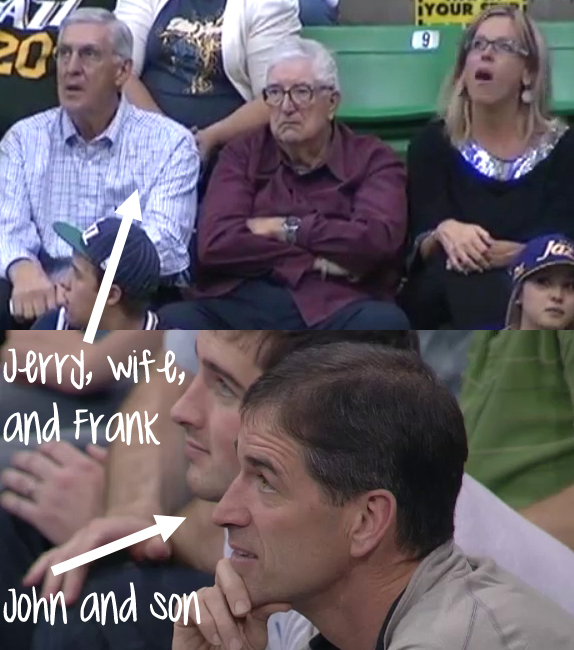 Question: did the Jazz acknowledge Sloan and Layden? I know Stockton was shown to the crowd and got huge cheers. Tell me they showed Sloan and Layden as well, please. P.S. : Damn International League Pass Broadband, I wish I could watch Matt and Boler instead of those TNT bozos. No, they didn’t. Confirmed by someone who was at the game and sitting in the same section as Jerry and Frank. They didn’t acknowledge Jerry at the game he attended a few weeks back either. And acknowledged Stock! Wow. I remember they hadn’t shown him in the first game he attended, but I really thought they’d be better than that this time. I am! Favors, silver lining! Yes, yes I am turned on. How did you know?